Alpet D2 Surface Sanitizer - 1 qt. Spray it and you're done! This spray is useful for sanitizing ball valves on conical fermenters, and anything else you can't easily soak in sanitizer. 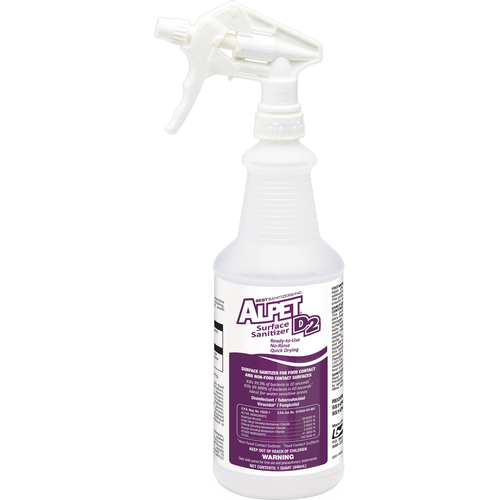 Alpet D2 Surface Sanitizer kills bacteria and wild yeast after a 60 second contact period! It contains isopropyl alcohol, water, and a residual bacterial killer called QUAT. No rinse, just allow to air dry. Ease of use and effectiveness. I bought a cheap spray bottle at Home Depot and put Star San solution in it. Any reason why this more expensive product would be better? BEST ANSWER: Hello George - CL60 is designed to be used in harder to reach areas, that cannot be soaked in Star-San. Being Isopropyl Alcohol based, it can be slightly more effective and evaporates from the applied surface quickly. Unlike Star-San it comes packaged in a spray bottle, so this adds to the cost as well. Love this stuff!!! Whenever I use it I know everything will be clean. I wish the wipes were available as well! I use on anything that is too large to submerge. Always use this on opening the conical, spraying on aluminum foil for yeast starter airlock, etc. has many additional ingredients to the 70% isopropyl alcohol. I find a bottle lasts me at least one year. I like to use this when I cant place something in a bucket of star san. Never had a problem with this and I like it. Easy to use. Spray it and your done...Easy peezy lemon squeezy! Seriously, just buy this stuff. Sanitation is everything in brewing, and this lets you fix all the little bumps you make with your tubes, deal with things like keg posts, clear the air around your carboy's top, etc, etc, etc. I use it everywhere, all the time. This is the best sanitizer for spraying down my fermentation chamber surfaces, love it! I use this to sanitize the ball valves on my conical fermenters....and anything else I can't easily soak in sanitizer. Never had an issue with contamination since I've started using this product.